Utility Knife 6.5" Polyprop - Spyderco, Inc. Page 852 – Spyderco, Inc.
Spyderco’s involvement in kitchen knives dates back to the early 1980’s and the beginnings of the company’s knife production. After being discontinued a number of years ago, they are now back by popular demand and better than ever. Our current kitchen knives combine all the distinctive features of the originals with an improved handle material that offers increased durability. The K04 Utility Knife has a 6.5-inch drop-point blade that is ideal for a broad range of kitchen cutting chores, making it the most popular “go-to” knife in many home and commercial kitchens. Like the original version, it features a premium MBS-26 stainless steel blade, ground exceptionally thin and meticulously heat treated for optimal cutting performance. Its durable polypropylene plastic handle is injection molded directly onto the tang of the blade and features a distinctive “stepped” texture pattern that provides exceptional comfort and control during use. 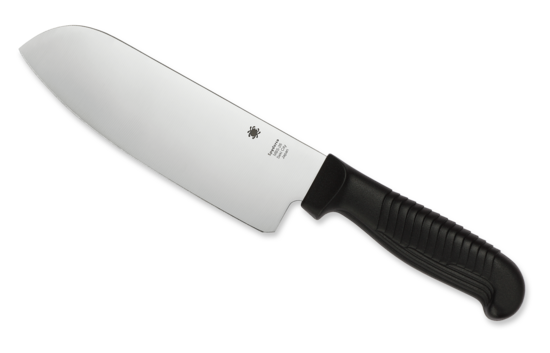 This version of the K04 features a razor sharp PlainEdge or a SpyderEdge blade with a unique two-step serration pattern that protects the edge from dulling on cutting boards.